Durational performance over 8 days built into the gallery wall. 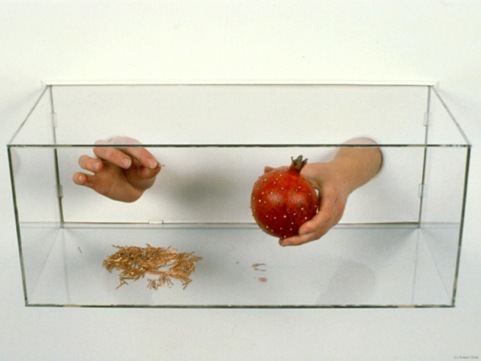 Inside this two hands are seen turning and sticking copper pins into a pomegranate. The juice of the pomegranate reacts with the copper to produce a black ink-like liquid which collects on the bottom of the box. Each sequence of pushing in a pin takes one minute. By the end of the day the pomegranate is studded with pins.